Bridget Harris demonstrates tenacity and trial skills in court. Bridget has been honing her trial skills for more than a decade, and she isn’t afraid to step into a courtroom and argue a case. She has a relentless attitude when it comes to defending her clients. Bridget primarily practices in the areas of product liability, catastrophic injury, white collar criminal defense and corporate investigations, medical malpractice and commercial litigation. Gaining valuable courtroom experience even before passing the bar, Bridget served as the captain of the award-winning Trial Advocacy Competition Team at the University of Alabama School of Law. Before that, she led her university and high school mock trial teams to regional, state and national championships. Prior to law school, Bridget served the Alabama educational community as a Teach for America Corps member, sharing career preparedness tips with students at Robert E. Lee High School in Montgomery. 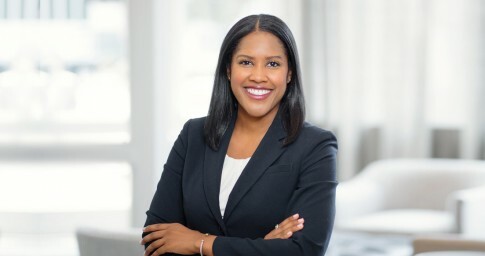 While in law school, she completed 90 hours of volunteer work, including mediating family law cases and providing legal and community services to the less fortunate. Bridget received the Dean’s Community Service Award, the Student Pro Bono Award and the Order of the Samaritan — the highest public service award bestowed by the University of Alabama School of Law. She has continued to help those in need through the Birmingham Bar Volunteer Lawyers Program. These pro bono experiences have allowed Bridget the opportunity to work with individuals from all walks of life. She knows what it takes to make clients feel comfortable and optimistic about their legal situations. With her positive attitude, Bridget is able to assure her clients they are in good hands. Away from the office, Bridget is involved with her church and enjoys spending time with family, gardening, watching basketball and playing the violin. She has a passion for seeing the world and has set a goal of traveling to a new country each year. Obtaining a favorable ruling from the Alabama Supreme Court on behalf of International Paper in a case stemming from a contractor's breach of contract allegations and other claims related to a waste services agreement. Lightfoot filed a motion to dismiss based on improper venue and sought mandamus relief when the trial court withheld ruling on the motion to dismiss while proceeding with other substantive issues in the case. In a unanimous decision, the Alabama Supreme Court ruled that the trial court exceeded its discretion when it proceeded with substantive, merits-based issues before ruling on the motion to dismiss for improper venue.